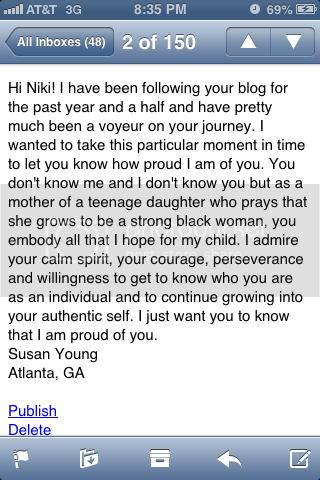 Last night I got an amazing comment from a woman in Atlanta who says she has been following my blog for sometime. I'm sharing this with y'all not to pat myself on my back, because honestly, these comments just make me so humble. For someone to see all that in me just let's me know that God is working through me. I do my best everyday, but I am far from perfect. I write this blog as authentically as I can, because I feel driven to do so. If there is something you feel driven to do, go after it! Do it! I cannot tell you how many times I've pushed myself to try something, even though I was scared to fail. Every time, I'm surprised by the results I get.